Black magic is the force that rules the world, so it is the Satanic black magicians which constitute the true controllers of the world – at least in the human Earthly realm. The Satanic black magicians pull the strings, not politicians, corporate bosses, military heads, intelligence chiefs or even international bankers – although they also hold many of those roles. Black magicians rule the world, not politicians, bankers or military heads. 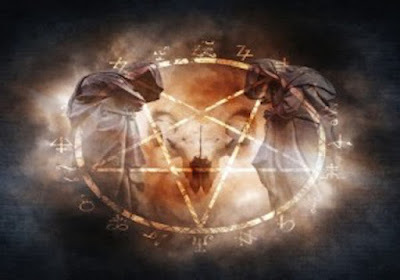 Black magic harnessed through Satanic ritual is the dark force behind it the NWO conspiracy. Remember the saying of the Chinese sage Lao-Tzu, who said that “symbols rule the world, not rules or laws”? Symbols communicate at a deeper level than words, because they are decoded by the right, intuitive brain, whereas words are decoded by the left, logical brain. Symbols are able to penetrate more deeply into our subconscious, which is why the elite are so obsessed with their occult corporate and governmental logos of red crosses, rising suns, all-seeing eyes, pyramids, 666, the rings of Saturn and inverted pentagrams (check out the work of Freeman who has done a great job exposing this). Words attempt to rule the world, but they can never be as powerful as symbols. Before looking at the evidence of elite use of black magic, it is worthwhile remembering a defining aspect of Satanism: the inversion of everything. Black is white, bad is good, wrong is right. This is why the inverted pentagram is such a popular Satanic symbol.